Skinny pants trends carry on into winter in Japan. 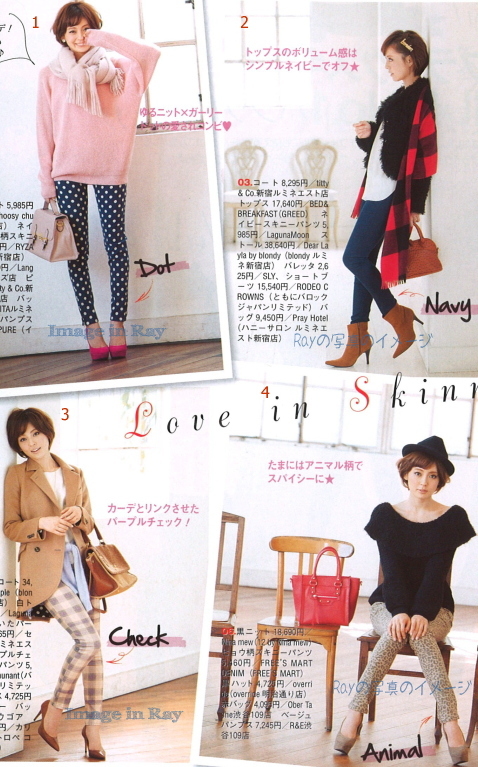 From prints to plain color skinny pants, Ray magazine shows you the Japanese way of coordinating skinny pants, creating style variations. 1. White polka dots, navy skinny pant gives a very classic 50s feel. Ray goes simple by pairing the top with a sweet light pink knit sweater. And there it goes for the cute look, a nice attire for dates! 2. Navy skinny pant is a classic must-have as it goes well with anything. The top is paired with a short black poodle coat.The coordinate gives a very casual yet chic feel. Plaid stole completes the outfit adding some coloring to the otherwise chic tone. Isn’t the style cool and ladylike? 3. Light purple plaid skinny pant might not be everyone’s cup of tea, but Ray paired it off brilliantly with a beige long coat, creating a simple but very feminine style. 4. Earthy tone leopard prints skinny pant adds a little bit of spice without being too showdy. Good for occasional change from a boring wardrobe. Ray matched it with an unique voluminous cape collar boucle knit. Doesn’t this look posh and stylish?